If you want steampunk cufflinks that will become definite conversation pieces, then you'll love this project. THE USE OF AN EMBLEM AS ENTRANCE TO A SOCIETY OR CLUB HAS LONG BEEN DE RIGUEUR FOR THE SMART GENTLEMAN ABOUT TOWN. The most sought-after badge of entry is, of course, The Green Fairy. In cufflink or tie-pin form, this allows entry to that most exclusive of venues, the Verdigris Club. From the exquisite balconies of the Art Nouveau mansion in which the club is housed, the sounds of laughter and earnest discussion pour forth. The lights of a hundred chandeliers sparkle as champagne is poured and inventions discussed. Beautiful ladies in stunning gowns assemble on the roof to view the night sky and discuss telescopes while dashing gentlemen play cards in the club lounge planning their next trip to Cassiopeia. Membership is strictly by invitation, and it is of course a joy to see the egalitarian ideals of the French at the fore as luminaries such as M. Mesmer of the Academie Étoile Français and inventor M. de Villeroi rub shoulders with the Prince of Wales. 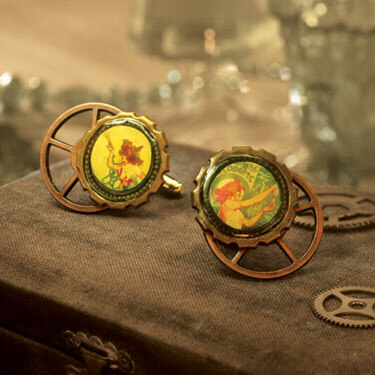 "Green Fairy" Steampunk Cufflinks is a quick project, but with resin and epoxy curing time, you'll need to plan to work over a couple of days. All together plan for about an hour, split over 3 days. If it’s not already the correct size, you will need to adjust your vintage image to fit the bezel. You can use Photoshop or a similar program to shrink the images down; just remember to keep the image at a nice sharp resolution, and make sure it is copyright free. Print out the images and neatly cut them out. Paint a thin layer of the gel medium onto the plastic sheet. Place the image on top of the gel, and paint on more gel. Make sure all the gel is completely dry before cutting the image from the plastic. 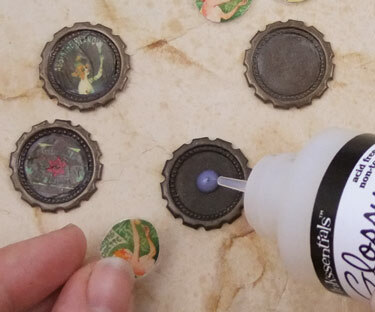 Most inks will bleed if you just pour resin or similar products on them, creating a murky image or one that has transparent patches. To avoid this, I seal the pictures either with sticky tape on both sides or with a gloss gel medium. 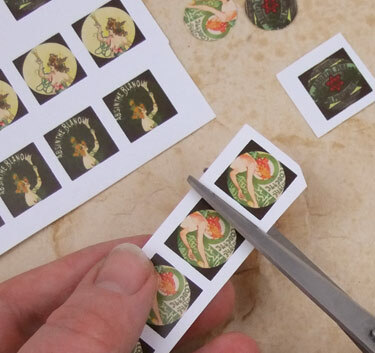 When you trim the images from the gel or sticky tape, make sure there is a tiny sealed border around them to avoid having the resin or Glossy Accents seep in around the edges. Using the Glossy Accents, adhere the pictures, image side up, into the bezels. Very slowly, squeeze a thick layer of the Glossy Accents into the bezel; keep the tip of the tube just touching the gel to avoid air bubbles. If you do get a bubble, prick it with a pin. Allow it to cure for 12 hours it is until clear. The combination of gel medium and Glossy Accents will fade an ink-jet print to a vintage hue. 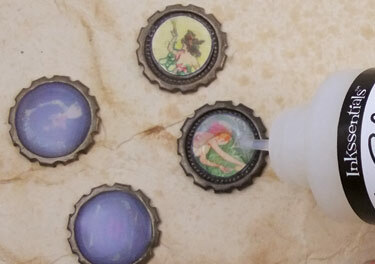 You could also use epoxy resin or UV resin on sealed paper for a slightly brighter look. 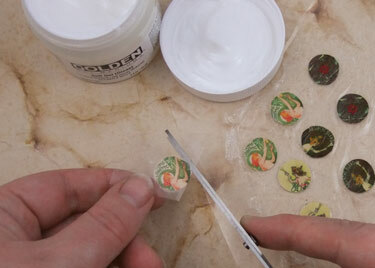 Mix up some of the 2-part epoxy glue. 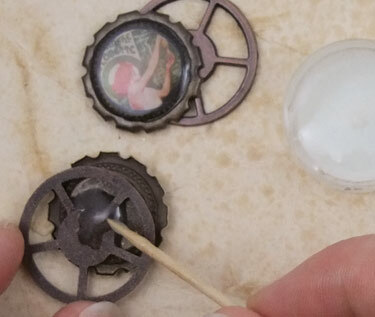 Use a cocktail stick to apply the glue to the back of the bezel. Make sure you apply plenty of glue, but keep the glue surface flat, not mounded, so you can apply the cufflink shanks later. Attach the large cog to the back of the bezel. 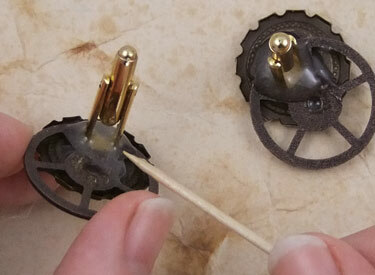 Applying the cog pieces separately to the cufflink shank gives you more control than trying to attach everything at once. Take a moment to work out which way up the pictures should be and how the cufflink shanks should attach so the image will look nicest in the cuff. Mix up another batch of epoxy glue and finally stick the cufflink shanks to the back of the pieces. Allow the glue to dry for at least 12 hours to gain its full strength. 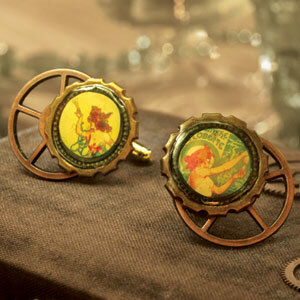 These steampunk cufflinks are featured in Steampunk Emporium by Jema "Emilly Ladybird" Hewitt. The talented Miss Emilly Ladybird has many more beautiful projects and enchanting and fantastical tales to tell in her book so if you enjoyed this one, you'll love the rest too. "MAKE HASTE AND PACK YOUR BAGS RIGHT AWAY. You're not going to want to delay this charming adventure! 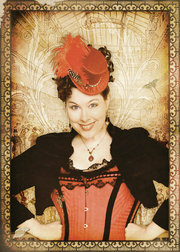 Whilst perusing the pages of Steampunk Emporium, the harrowing antics of Miss Emily Ladybird will engage you in the most enchanting of worlds. Join her as she records the adventures of intergalactic space pirates, undersea voyagers and Jurassic explorers — all the while, dabbling in the details of which baubles best benefit the venturesome class." 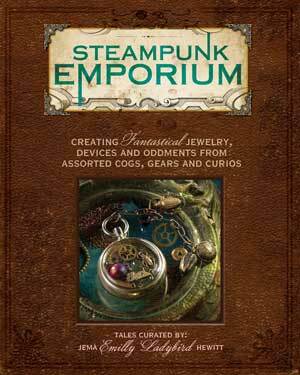 The publishers of Steampunk Emporium: Creating Fantastical Jewelry, Devices and Oddments from Assorted Cogs, Gears and Curios, have kindly given How-to-Make-Jewelry.com permission to reprint the cufflink project instructions so you can get a little taste of what you're in store for if you grab your own copy. Steampunk cufflinks it was. I'm pleased with my choice too. If you do grab a copy of this book, you won't be disappointed. The photography and imagery in the imaginative stories alone are worth the price of the book. It goes without saying that the projects are just as delightful. They are the proverbial cherry that tops the cake. Or should I say the petits-fours?